When Sammy Stewart was asked by the National Baseball Hall of Fame what he considered to be his most outstanding achievement in baseball, he quite justly answered that it was the rookie record he set in 1978 when he threw seven consecutive strikeouts in his major-league debut. No rookie has matched Stewart’s totals. It was September 1, 1978, at Baltimore’s Memorial Stadium, facing the Chicago White Sox. He got through the first inning, despite a leadoff single, his own error, and a wild pitch. The O’s scored four times in the bottom of the first. Then Stewart struck out the side in the second, struck out the side in the third, and whiffed the first batter in the fourth. Mike Squires spoiled the streak by popping up to left field. Stewart and the Orioles won the game, 9-3. It’s a record he still holds. In his only other 1978 appearance, four weeks later to the day, he lost a tough 3-2 game to the Detroit Tigers. Stewart had allowed two earned runs, but an error by his center fielder cost the game. He was a junior, born to Samuel Lee Stewart Sr. and the former Mary Faye Wardrup on October 28, 1954, in Asheville, North Carolina. The boy who became known as “The Throwin’ Swannanoan” grew up in that North Carolina community, attending eight years of elementary school and Charles D. Owen High School. He completed two years at Montreat Anderson Junior College. Stewart was selected by the Kansas City Royals in the June 1974 free-agent draft, but not until the 28th round. He elected not to sign that year, but did so as a nondrafted free agent when approached by Baltimore scout Rip Tutor, signing on June 15, 1975. The Orioles assigned him to the Bluefield Orioles in Bluefield, West Virginia, in the Appalachian League, a rookie league. He appeared in 18 games, starting in four, and compiled a 3-3 record with an ERA of 6.07 while getting his feet wet for the first time. He was still only 20 years old. Stewart took full advantage of his first full season in Organized Baseball, pitching in Class A for the Miami Orioles (Florida State League). Throwing 182 innings, he put up a 12-8 record with an earned-run average of 2.42. Climbing two rungs on the ladder in 1977, Stewart was promoted to the Triple-A Rochester Red Wings. He was 0-5, then positioned a bit lower, moved to Double-A and the Southern League’s Charlotte O’s (9-6, 2.08 ERA.) He finished 0-5 (6.33) with Rochester, but that’s where he was reassigned in iole1978, and this time he made good, winning 13 and losing 10 with a 3.80 ERA. And at the end of the year, he was given that first start and struck out those seven White Sox one after the other. He wouldn’t see the minor leagues again other than for eight innings with Hagerstown in 1982 and 11? innings in 1987 for Buffalo at the end of his career. Stewart was a right-hander standing 6-feet-3 and listed with a playing weight of an even 200 pounds. He had married his high-school sweetheart, Peggy Jean Logan, in January 1977. The couple had two children, Colin and Alicia, both born with cystic fibrosis. It was important for him to remain as close as he could to hospitals of quality. In 1979, Stewart was used primarily in relief – though he won each of the three starts he was given, pitching seven, nine, and eight innings and never giving up more than two earned runs. It was hard to crack manager Earl Weaver’s five-man rotation featuring Mike Flanagan, Jim Palmer, Scott McGregor, Dennis Martinez, and Steve Stone. There were only five starts all season by anyone other than the main five, and Sammy had three of the five. That rotation carried the Orioles to a division championship, eight games ahead of second-place Milwaukee, and to a pennant, winning the best-of-five American League Championship Series over the California Angels, three games to one. Sammy played no role in the ALCS. He did see action in the World Series, coming on in early relief of Dennis Martinez in Game Four at Pittsburgh’s Three Rivers Stadium. The Pirates already had three runs in. He gave up one hit, allowing an inherited runner to score from second, but in 2? innings of World Series work was not charged with a run, earned or unearned. The Pirates prevailed in seven games. Stewart came into baseball after the AL adopted the designated-hitter rule, and finished before interleague play. Accordingly, he never had a regular-season at-bat at any point, but he did bat once in the World Series. Jim Bibby struck him out. 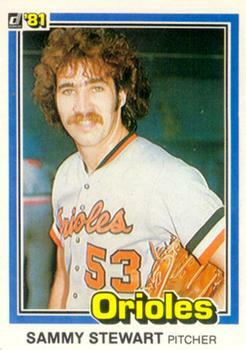 The 1980 Orioles had not just one, but two 20-game winners (Steve Stone actually won 25), but they finished second to the Yankees. Stewart posted nearly identical stats to 1979 – again, he started three times, but this time he lost the first of them. His ERA for the year was 3.56 instead of 3.52, negligibly different. He threw one more inning – 118? instead of 117?. The only significant difference was that Weaver had him close 20 games, double the year before. In 1982 Stewart did get 12 starts, mostly in May, but the rest were spot starts, and as the year wore on he became more disappointed that he never had more opportunities to start on a regular basis. He did let it be known, but there wasn’t a lot Weaver felt he could do. Stewart won 10 games (against nine losses), but saw his ERA climb to 4.14, in part because of problems due to bone chips in both knees which occasioned a 21-day disabled-list stint and a very brief two-game rehab stay in Hagerstown. The Orioles finished second, by just one game, to the Brewers for tops in the AL East. Sammy had pitched in the next-to-last game of the season, against the Brewers. Milwaukee had a one-game lead. Scott McGregor had given up three early runs to the Brewers, but Stewart came into a game tied 3-3 and allowed just two hits and no runs in the final 5? innings, while watching his teammates build an 11-3 game and pull into a dead heat for first place with one game to play. Jim Palmer was outpitched by Don Sutton in the final game, turning a 4-1 deficit over to the Orioles bullpen after five-plus innings. The final was Milwaukee 10, Baltimore 2. It was another year watching the postseason from home. The 1983 season was dominated by a major accomplishment: a return to the World Series. Stewart got just one start, but he closed 21 games for new manager Joe Altobelli and put up a 9-4 record (3.62 ERA). The O’s won the division, six games ahead of the Tigers, and took three out of four games in the ALCS. Stewart pitched a third of an inning in Game One, a 2-1 loss to Chicago and the only loss for Baltimore. He’d been brought on in the bottom of the seventh with runners on second and third, two outs, and catcher Carlton Fisk at the plate. He struck out Fisk, keeping it a one-run game. Touched in the eighth for a single and a walk, he was then replaced by Tippy Martinez. He entered the game in the sixth inning of Game Three with his team leading 6-1, and pitched one-hit ball over the final four innings as the Orioles took an insurmountable 3-0 lead in the ALCS. It might also have been a year (1983) when Stewart overcame a problem with alcoholism. He was arrested on July 8, only driving 40 miles per hour but driving erratically. He was given a small fine and sentenced to 18 months’ probation. Both Earl Weaver (who’d been arrested three times himself for drunken driving) and Joe Altobelli said they would work with him, and apparently they did. July 8 – “that’s the date of my last scotch and water. I’m glad it happened. … I needed help,” Stewart said in October.11 The episode was not the last problem he would have with substance abuse. Things fell apart for the team in 1984. The Orioles finished 19 games out of first place. Stewart led the staff again, this time appearing in 60 games and became a defined closer, finishing 39 games and with a career-high 13 saves. He was 7-4, with an improved 3.29 ERA. It wasn’t much better in 1985, and Stewart finished almost as many games (36), while pitching quite a few more innings and seeing significant increases in the number of hits, walks, and more than double the number of home runs allowed. His ERA at 3.61 was still superior to the team’s 4.38. On December 17, 1985, Stewart was traded to the Boston Red Sox for infielder Jackie Gutierrez. Boston was anxious to build a better bullpen. On November 12 Stewart was granted free agency – in other words, the Red Sox let him go. Opening Day 1987 came and went, and Sammy Stewart still didn’t have a job. On June 4 he was signed by the Cleveland Indians, shuffled to Buffalo for six innings of work in six appearances (0-1, with a poor 9.26 ERA) but still brought up to the big leagues for what proved to be his swan song: Beginning on July 2, he appeared in 25 games, throwing 27 innings. His first appearance helped the Indians win a game; he came in during the top of the ninth of a 1-1 tie in Chicago with one out and a man on. He retired five White Sox in a row, carrying the game through the 10th. Cleveland ultimately won it in the 11th. Called upon again in the top of the ninth the next day, Stewart was hammered mercilessly by the same White Sox. This time he’d been asked to hold a 9-8 lead, but he gave up two hits and three walks, threw a wild pitch, and saw all five runs score. By season’s end he had whittled that ERA down to 3.32 in mid-September, then seen it climb back to a final 5.67. He wasn’t asked back, released on October 29, at which point he’d reached the end of the string in Organized Baseball. He retired the following year. His final totals were 59-48, 3.59, with 45 saves. In October 2006 Stan Grossfeld wrote a lengthy profile of Stewart in the Boston Globe, after visiting him at North Carolina’s Piedmont Correctional Institution. Stewart wrote, “‘There’s a lot of times I wished I would have died because I was pathetic,’ he says matter of factly. ‘I guess I started digging a hole for myself and it got so bad I got homeless, moneyless, friendless. I just started covering myself up instead of climbing out of the hole.’ ” He told of sleeping under bridges, of shooting up and getting shot at. He untruthfully told people his daughter had died, so he could get some sympathy and ask for a little money to help out. Unsurprisingly, his wife, Peggy, and Stewart separated. This author tried several times to correspond with Stewart at the facility he’d moved to after Piedmont, the Buncombe Correctional Center in Asheville – but never heard back. However, following the August 2011 suicide of Mike Flanagan, Stewart did send an open letter to fans in care of Dan Connolly in which he said, in part, “These last five years have definitely altered my reality; prison is not the place to be. I’m glad I have learned humility, and I work hard to stay teachable. We all must. He was found dead on March 2, 2018 at a residence in Hendersonville, North Carolina. This article appeared in "The 1986 Boston Red Sox: There Was More Than Game Six" (SABR, 2016), edited by Bill Nowlin and Leslie Heaphy. Thanks to Sammy Stewart and his friend Cherie Linquist for reading over the biography for accuracy in September 2013. 1 See Bill Nowlin and Lyle Spatz, "Choosing Among Winners of the 1981 AL ERA Title," Baseball Research Journal, Spring 2011. 2 Ibid. Righetti did not qualify for the American League title, however. 3 Albany Times-Union, June 2, 1981. The Palmer quote comes from the Boston Globe of October 25, 2006. Revering felt he’d been disrespected. A week later, on June 2, he hit an 11th-inning homer off Stewart to win a game. 4 The Sporting News, April 3, 1982. 5 Albany Times-Union, June 2, 1981. 6 Albany Times-Union, June 2, 1981. Gammons wrote in The Sporting News, March 28, 1981. 7 Boston Globe, October 25, 2006. 8 Boston Globe, October 25, 2006. 9 Albany Times-Union, June 2, 1981. 10 Unattributed September 13, 1980, clipping in Stewart’s Hall of Fame player file. 11 Unattributed October 17, 1983, clipping by Mike McAlary in Stewart’s Hall of Fame player file. 12 Boston Globe, October 25, 2006. 13 Baltimore Sun, October 10, 2011. 14 Baltimore Sun, October 10, 2011. 15 Dean Hensley, Hendersonville Times-News at BlueRidgeNow.com, April 22, 2013.